Awesome, fast, very intuitive and easy to use. After (unsuccessfully) trying to move selected audio from my Mac to Iphone for over 30min, i was literally crying with frustration about iTunes. Your product solved my issue in 30 seconds...Thanks!! First and foremost, I am not a techno geek (no bad inference) I am totally technically challenged. I called my son to come and delete my photos off my iPad Air 2, because I didn''t have the room to make an upgrade. He''s so buried with his work projects and hasn''t had a chance to drop in, I installed the iOS version for the MAC, no problem, I set up the iPad as instructed and after a few trial and errors, BAM! I was able to delete 6gbs of unwanted photos. I''ve acquired the ileef iBridge storage flash drive and now have all my photos on it as well as my music lists, total 20gbs, I''ve still got 40gbs of room on my flash drive, amazing! Get this and use it to solve your issues, I couldn''t do it my using iTunes because it''s too convoluted, this app smokes it all!!! It works great, it made my life easier. Transferring my music from Ipad to Macbook Pro or vice versa has never been so easy. Thanks guys, you really know what you are doing. Nice software to use it. My Mac had suddenly died and lost my iTunes music. So I thought i'll lost the songs forever until a search found me MobileGo for iOS. It worked flawlessly to copy music from my ipod touch to my iTunes music Library on Mac. tried it in the latest OS X Mavericks. It does such an amazing job to copy songs from my iphone 5s OS 7 to iMac. Well done! I have used MobileGo for iOS (Mac) for some years now and I am very happy to recommend it. I have used it many times to backup my iphone to my macbook air. Fantastic product!!! my macbook pro just crashed, lost iTunes Library. This product rebuild my itunes library by transferring songs i've saved on my ipod touch. You can't depend on iTunes to rebuild your iTunes Library or backup music, videos, photos, voice memos, etc. to your Mac. It simply can't do it. 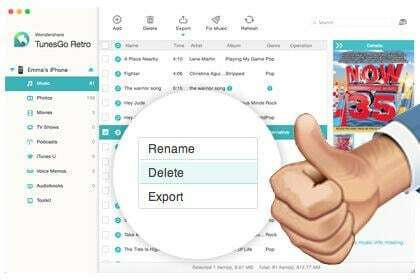 Instead, you need a transfer software tool like Wondershare TunesGo Retro (Mac). 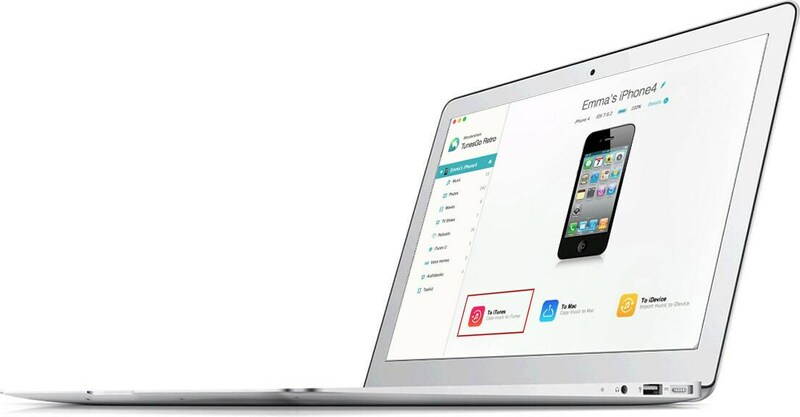 It's a professional iPhone/iPod/iPad manager for Mac. It not only does what iTunes can do: transfer music, videos and photos to iPhone/iPod/iPad, but also does what iTunes can't do: let you copy iPhone/iPod/iPad music and playlists (smart playlists included) to your iTunes Library with ratings, play counts & skips or backup videos, photos, voice memos, Podcasts and more to your Mac. Now, you'll no longer worry about issues when managing your songs, photos, and video. Whether you've bought a new Mac computer or lost music from your iTunes Library, now with Wondershare TunesGo Retro (Mac), you can export all music and playlists on your iPhone, iPad and iPod touch/classic/shuffle/nano to your iTunes Library on Mac with ratings, play counts & skips. What's more, this feature never duplicates any song or playlist you've had on iTunes Library. That means it only exports songs and playlists you don't already have on your iTunes Library from iPhone, iPad, iPod touch/nano/shuffle/classic to your iTunes Library. Want to backup some songs and videos on iPhone, iPod touch, or iPad to your Mac’s hard drive? Or have you taken so many photos with your iPhone, you need to copy them on Mac for further editing? 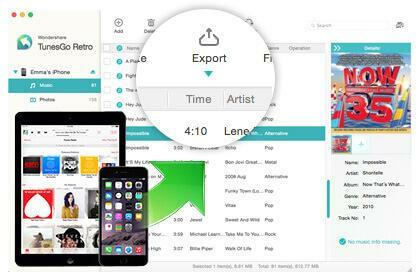 With Wondershare TunesGo Retro (Mac), simply select the music, videos, or photos on iPhone, iPod touch and iPad that you want and click "Export to Mac" to transfer them to iMac, MacBook Pro or MacBook Air. Now, Wondershare TunesGo Retro (Mac) lets you transfer music and playlists with full info from iPod shuffle/nano/classic to Mac. Export Camera Roll and photo albums to Mac. Have some killer songs & video, but can’t transfer any of them to iPhone, iPod touch, or iPad for play? Keep your shirt on. Let TunesGo Retro (Mac) do it for you. Whenever you drag an incompatible file to iPhone, iPod touch, or iPad via TunesGo Retro (Mac), it will convert the file properly for you. And it never wipes out the original files on your device. What’s more, it transfers photos from Mac to iPhone/iPod touch/iPad as well. 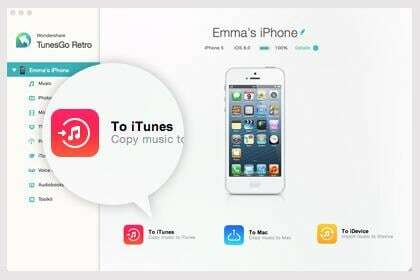 Wondershare TunesGo Retro (Mac) is a total iPod touch, iPhone, & iPad manager. Use it to manage music, videos, photos, and albums, just about any media file, on iPhone, iPod touch, and iPad easily and efficiently. Transfer music and playlists on iPhone, iPod touch, and iPad directly to your iTunes Library with ratings, play counts & skips. Create new playlists on iPhone, iPod touch, and iPad with drag-n-drop. Simply click to add media files from Mac or delete files from your iDevices. Build albums by dragging and dropping photos from your Camera Roll or Photo Library. How to export my iPhone's playlists to my iTunes library on Mac? How do you fix “The iTunes Library.itl file is locked…” error?